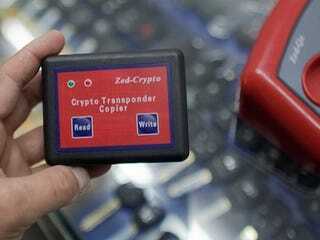 Where exactly does a gadget labeled Crypto Transponder Copier come into the process of copying a car key? The people at Shanghai’s Yi Tong International Automobile Fittings Town appear to know—and they’re not afraid to use it. I have to admit I know very little about the technology of the modern car key but I hope some of you in the comments are well enough versed in its intricacies to make sense of a vaguely disconcerting photo essay on the blog Future Perfect, which deals with a shop in Shanghai which will copy any key. For instance, what could possibly be the function of the Gambit Key Maker, a device with with twin BMW and Mercedes–Benz logos on its cover?